Start with our Standard version — it's FREE! 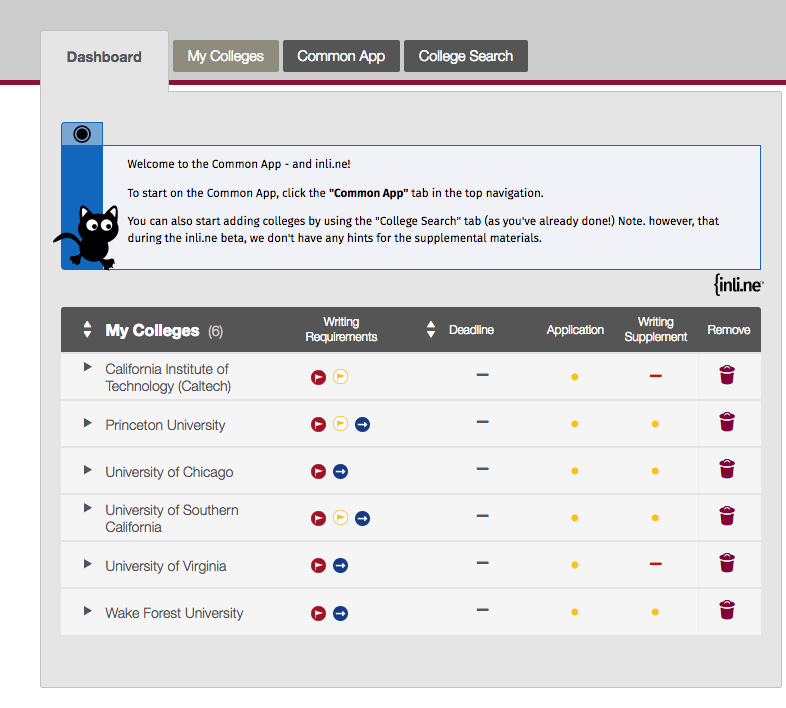 All colleges using the Common App® will require at least those sections that are covered in the Standard version. That might be all you need, in which case you won't have to upgrade at all. Some colleges require additional sections (like essays and college supplements), and if you want help with those, you can always upgrade from within the Standard version. You can wait to see if you even need those extras before upgrading. For those of you who remember college applications only on paper: students today typically submit their college applications online, and most selective colleges in the United States use an online platform called the Common Application to streamline the process. Inline is not affiliated with the Common Application; we make it easier to use it strategically and put your best foot forward. You might have to talk to your college counselor about having your school's IT administrator or IT department "whitelist" https://inli.ne, https://www.inline.com, and https://inlinecoach.com from the firewall (i.e. make an exception to the firewall) so that you can access Inline and use it while you're on your school's internet network. Anytime after January 1 of your junior year is a good time to create your Common App account and download Inline. Your license is good for two admissions cycles, so you can use the time between January 1 and August 1 (when the Common App officially “opens” for the admissions year) before your senior year to get a head start on the process. You can deactivate or delete Inline at any time. 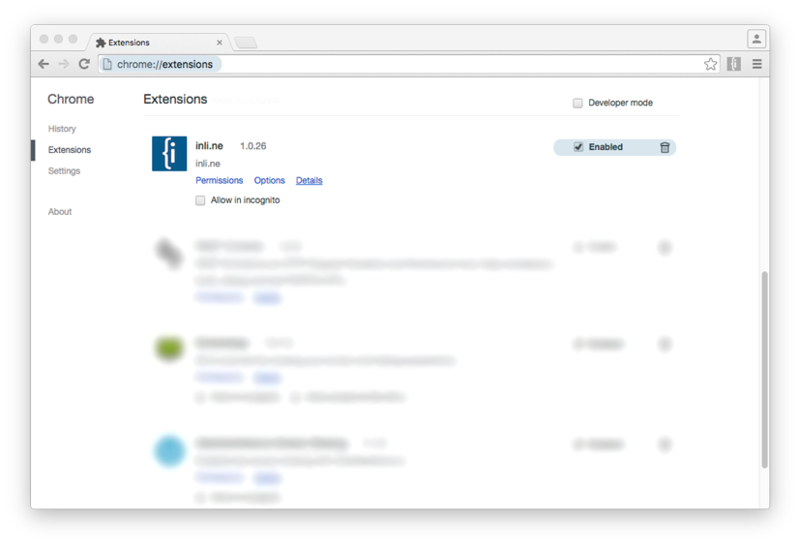 In Chrome, just navigate to chrome://extensions and either disable or delete the extension. Please visit our online help desk. If you can’t find an answer to your question in the FAQ, please contact us at help@inli.ne. ​We are also in friendly contact with the good people who run support over at the Common App. We keep each other in the loop about which problems are on the Inline side, and which problems are on the Common App side. If you want to ace your college applications and get the inside scoop from experienced college admissions officers who have been up to their elbows in all the glory and all the quirks of the Common App for years, then Inline is right for you. Try the free Standard version and see for yourself! Yes, it is possible to gift inline to an applicant. Just select the gift option in the checkout process. Yes, we have special pricing for schools. Contact us here. Yes! We come from the consulting world of IEC's, and we’d love to work with you and offer discounts for your college counseling students. Visit this page for pricing and more information.